Water logging proves to be a menace yet again. 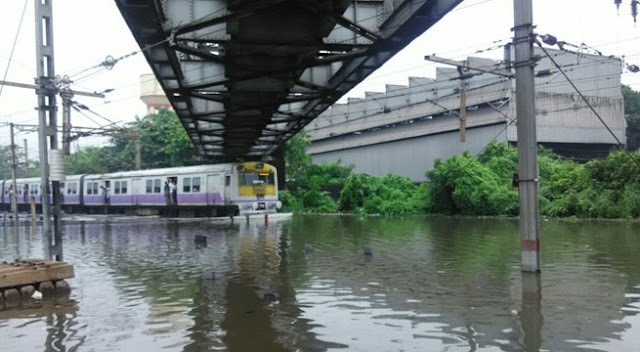 The carshed remained submerged on Wednesday leading to the cancellation of 45 local trains. Long Distance trains are also running behind their expected schedules. The following cancelled express trains are, Howarah-Barbil Janshatabdi Express, Howrah-Digha Tamralipta Express, Howrah-Purulia Rupashi Bangla Express from Satraganchi, Ispat Express to name a few. Dhauli and Falaknama Express are running considerably late. Few trains such as Down Chennai Mail, Mumbai Mail, Korapur Express and Adra Passenger Mail have been stranded in Satragachi station since Wednesday morning. Meanwhile, 35 local trains of the South-Eastern railway division have been cancelled. Kalka, Mithila, Sarighat,New Delhi Duronto Express are plying hours late. Local trains to Kharagpur, Uluberia, Mecheda and Amta have been cancelled.